JEANY A. DUFF is a partner with the law firm of Vogt | Resnick | Sherak. Ms. Duff’s practice focuses on probate and trust litigation, representing both fiduciaries and beneficiaries, as well as general civil litigation. Ms. Duff is an experienced trial lawyer. Her practice draws upon her civil litigation background, having successfully handled numerous business and employment law disputes. Ms. Duff is a member of the California State Bar. 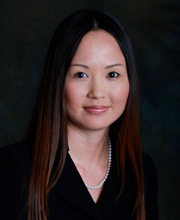 She is also a member of the Orange County Korean American Bar Association and the Orange County Women Lawyers Association. Ms. Duff obtained her Juris Doctor Degree from Loyola Law School in Los Angeles, California and her Bachelor of Arts Degree in Law & Society from the University of California, Santa Barbara.